Aluminization of steel results in higher qualities of heat-reflectivity and corrosion resistance in the presence of heat. 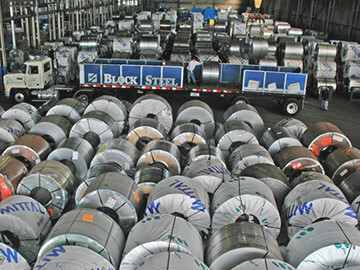 Aluminized Steel – Block Steel Corp.
Aluminized steel is prized in applications in which both the surface qualities of aluminum and the strength and durability of steel are required in the same materials. Aluminized steel is commonly sold by steel service centers, which are facilities that purchase manufactured steel and resell the steel after processing it. Aluminized steel is a unique material, as neither steel nor aluminum alone has both of these characteristics. Because it is highly corrosion-resistant and conductive, aluminized steel is an ideal metal for electrical chassis applications. Water heater components, fireplace components, engine parts, furnace parts, oven components, roofing and siding material, air conditioner housings, agricultural containers, mining equipment and a long list of other products are commonly manufactured and fabricated using aluminized steel. Aluminized steel can be created in many shapes: tubing, sheets, plates, rods and bars are just a few examples. Just like other steel varieties, aluminized steel can be rolled, welded and fastened without the need for special treatment. To produce aluminized steel, a bond between the steel and the aluminum coating is formed, resulting in a product that has the strength and low cost of steel with the soft and smooth surface of aluminum. The silicon is used to help form a strong bond. Aluminized steel is produced in two grades. Grade One has a silicon-aluminum alloy coating. Because it can withstand extremely high temperatures of heat and oxidation, Grade One is used mainly in applications in which the material will be exposed to heat and corrosive agents. Grade Two, in contrast, has a pure Aluminum coating and is used in applications in which atmospheric condition-induced corrosion is a concern. The American Society for Testing and Materials standards require that aluminized steel be sold with an oil coating unless a special order requires some other finish. However, many manufacturers of aluminized steel produce hexchromated finishes for marketing purposes. Because of the great diversity of contexts in which aluminized steel is employed, different aluminized steel producers adhere to different standards and produce steel products with a wide range of features. Aluminized Steel Aluminized steel is steel that has been hot dip-coated with an aluminum silicon alloy. This cost-saving procedure is used in the construction, automotive, electronics, shipbuilding, aerospace and many other industries.